Mimi's brunch reminds me of brunch at Miriam when it first opened. Miriam was my first exposure to the wonders of the Israeli brunch--shakshuka, burekas, Israeli salad, and labne. Mmmm, labne. Lawman and I were early adopters at Miriam and it's still a favorite though the prices have creeped up over time--what once was a sub $10 brunch with coffee is now $11.95. The brunches at Mimi's don't come with coffee but the dishes are all under $11 with most going for $9. Our first visit to Mimi's we tried the masabache ($8), a traditional hummus with chickpeas and a lemon and garlic dressing served with a basket of fluffy pita. I love me some lemon in my hummus and this one was creamy and delicious. That first trip we had to try one of the brunch dishes and it wasn't an easy choice. 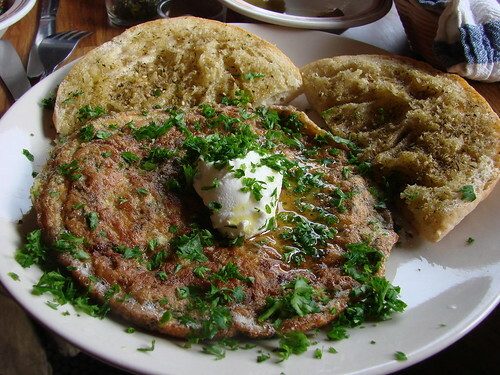 We went for the Idja (or is it Aija--I've seen it spelled both ways on the menu there0 ($9) which was a "green omelet" made with dill, cilantro, parsley, potatoes, and onions topped with labne (yogurty cheese) with a side of tabouli and a toasted pita. Why have I never thought of toasting pita, drizzling it with olive oil and dusting it with zaatar?! Brilliant. You add some labne to that, it's pretty much perfect. The omelet was good, but the toasted pita, labne and tabouli really made it for me and gave me a good idea for an easy make-at-home breakfast. Our second trip we tried another hummus, this time the mushroom one. Also very tasty, but I prefer the lemony masabache. When a menu includes three different shakshukas, you have to at least try one. It was a tough choice, but we went for the Shakshuka Green ($10) a concoction of braised greens, tomatoes and lemon topped with two sunny side up eggs and Bulgarian sheep cheese. Bulgarian sheep cheese deserves more play. It's like a feta with more bite. Unfortunately it was so delicious and beguiling that there are no photos. Next time! 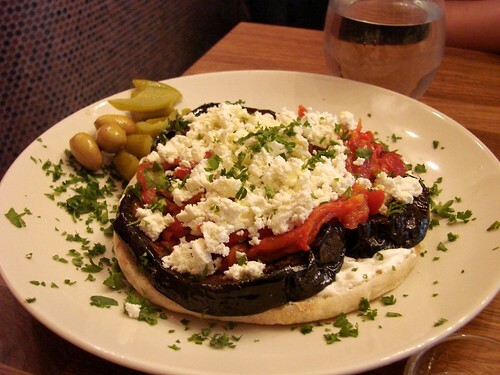 Speaking of Bulgarian sheep cheese, the best thing that we had for brunch was the Mimi's Sandwich--an open face pita with labne, roasted eggplant, roasted red peppers, and Bulgarian cheese ($10). It wasn't the most brunchy thing on the menu, but it was quite possibly the most delicious. Again, it's all about the cheese. The sharp, sharp cheese paired with the smokey eggplant and the roasted red peppers was heavenly. I'm still thinking about that sandwich. For more Mimi's brunch photos, check out our flickr set. oh my gosh! I've always wanted to try this place...but so far for me...in Brooklyn. How's the hummus? Reading this was kind of like reading organic chemistry equations. What's shakshukas? labnes? zaatar? masabache? I could probably look it up, but... I think it would help readers if the words were linked to Wikipedia or something? :) Just a suggestion. Lovely descriptions, from what I could understand. I'm compelled to try it! I live right by Mimi's Hummus, and it's really hard not to go in there everyday!! I'm addicted to their hummus, after you've had theirs every other one you eat is so disappointing! You must try their coconut balls! I've never tried lemon garlic sauce on hummus. But $8 is pretty expensive for hummus. I usually pay $6 at the Hummus Place in Manhattan. Do you find any differences? thanks. Ok, this place looks delish. I want to try Miriam's, but this place looks even better. 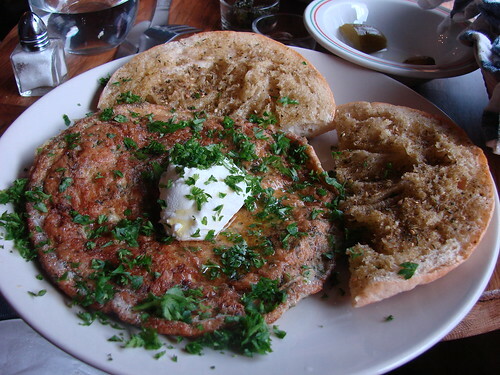 An aside, I would be surprised if Sahadi's in Brooklyn didn't have the Bulgarian cheese. (And at a more affordable rate than Murray's, too.) If it's sheep's cheese, it may simply be Bulgarian feta. Gar, I don't know about the Hummus Place, but I could almost put money a place like Mimi's would be tastier. I just don't trust that place. I've been dying to check out this area (cortelyou rd) so when i saw this pop up in my reader i couldn't get down there fast enough. the labane was equally awesom as was the beet salad and phillo dough wrapped ground beef thingy's we got as well. such a cute spot...i love reading your blog. Keep up the good work! @Gar: I think the hummus at Mimi's is better than Hummus Place. Masabache is my favorite at HP and I think Mimi's is more flavorful. @Krizia: Whoops! Sorry for the lack of links. I added them in. Sometimes I think my late night blogging privileges should be suspended! @Emily: You're a genius! I'm totally going to Sahadi's and I bet you're right that it's a Bulgarian feta. It was so sharp, salty and delicious. I've been to Miriam many many times and while I still like it very much, I think the menu at Mimi's while it's more limited is more interesting and the food is fantastic. Love to hear your take on it when you've given Mimi's a try! @Jackie: glad I didn't steer you wrong. :) I remember my first labne experience--it's it so good? I think I might do some Middle Eastern appetizers for Thanksgiving and labne with olive oil and zaatar is so easy and delicious. I'll have to put labne on my Sahadi's list. Thanks Brownie. 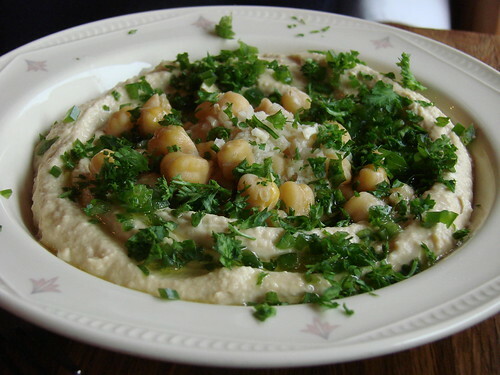 How's the hummus different (since it's better)? Is it really garlicky? Also, do they bake the pita in house? 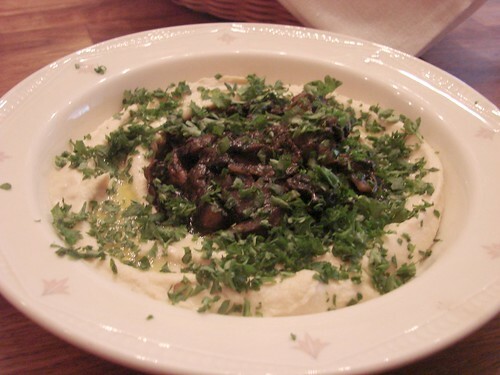 Serving mezes for Thanksgiving is definitely a great idea. Greek appetizers would be a nice touch as well. If you like labne, you probably like tzatziki as well, right? Hey Gar: The masbache at Mimi's is in my experience more garlicky, lemony, and generally more flavorful than Hummus Place. I occasionally find Hummus Place's hummus to be a little to tahini-y. I'm not sure if they bake the pita in house, but it was very fluffy and pleasant.